Upwave templates can be very valuable for any team that has repetitive tasks or projects. 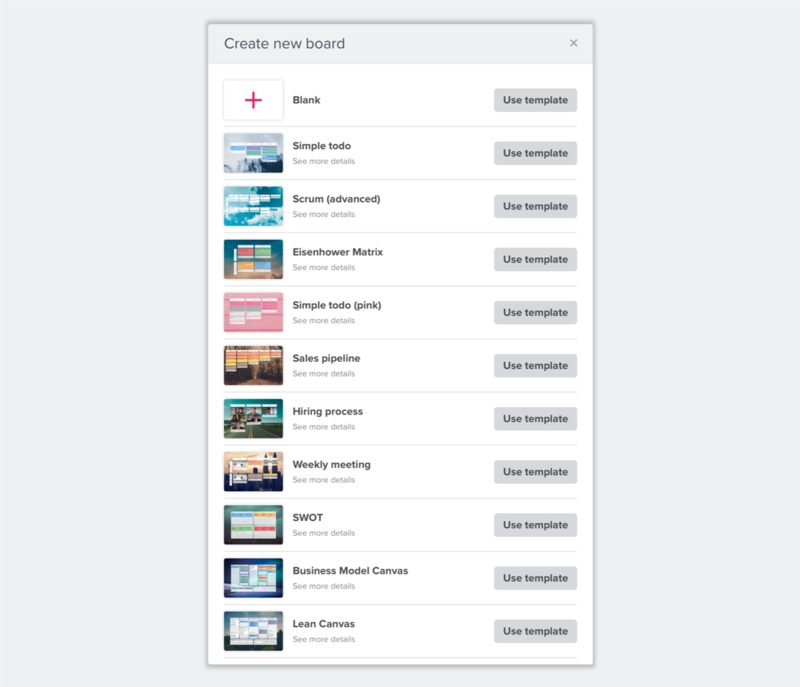 In a nutshell, it lets you start a new board with pre-defined structure and content. If you are having regular meetings, running sprints, or are using Upwave for weekly/monthly planning and follow up, templates is just the thing you need. When you create a new board, you will get a list of templates to choose from. Click on "See more details" to find out more about a template or click "Use template" to get started. You can also access templates from Workspace -> Templates tab. The latest used templates will be listed in your workspace and teams. Clicking on a template will create a new board based on that template. Who can create and modify templates? Anyone can create a template. All templates are shared on the workspace, so any member can use them. Modifying or deleting a template requires that you are either an admin or that you yourself created the template in the first place. Separate templates by using background images. For instance if you have several templates for areas such as meeting, development or planning, setting a different background image based on the "type" of template will make your team members recognize what that template/board is about by a glance.